Oh that is exquisite! I love grandfather clocks thanks to (none other) than my grandfather...he was sort of a "fine clock-a-holic". Surprised to not see any of his (and my) other favorite clock--the cuckoo. I have one, but the bird sounds sickly so I have it packed away. Now that is funny! I don't know why, but I had visions of a drunk bird there for a minute! 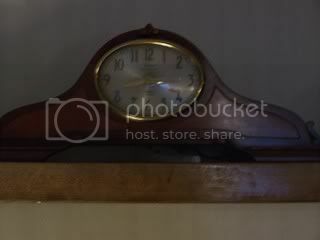 This is a clock that sits in my living room. It belonged to my husband's grandmother, who passed away several years ago. It is electric, and chimes on the quarter hour. I have no idea how old it is! Only about 24 hours left to post your photo! Prizes for the best photo wont be handed out,but Vegemite might be! Hurry! 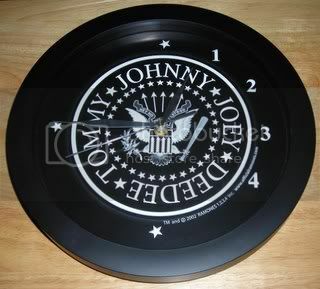 The Ramones clock. I used to have a cheapo, mundane kitchen clock, until someone gave me this. Sometimes it's hard to tell the time, but I enjoy the reminder of being at Ramones concerts when the only way to tell some songs apart was to hear DeeDee or C.J. yell '1-2-3-4' between 'em. My favorite watch. I only have two, had this one since 1990. It's been everywhere and it shows. 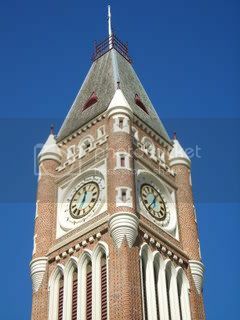 This is the clock tower of the Perth Town Hall. Opened in 1870, it is the only convict-built capital city town hall in Australia. If you look very carefully you'll see that the windows set into the corners of the clock tower are shaped like arrows. This little "touch" was unofficially added by the convict workers as a cheeky reminder of their contribution to the project. However, the government's "official" story was that these windows were always in the original design and the shape was a symbol of the Public Works Department. Yeah right! Really great photos everyone. 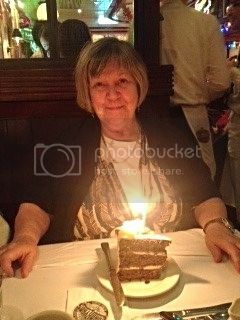 The latest slideshow can be found here. It`s random snaps as usual though I wish I could have included all the posted pics!